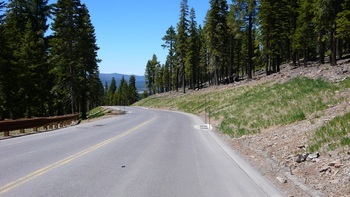 Integrated Environmental Restoration Services, Inc. (IERS) led the development and implementation of cutting-edge erosion control and revegetation treatments for cut and fill slopes along a newly constructed 4-mile stretch of Highlands View Road at Northstar-at-Tahoe. 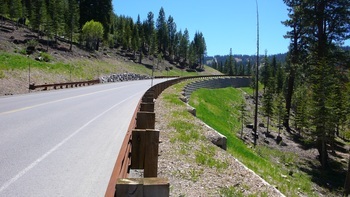 Primary goals of the project included slope stabilization, erosion control, native material salvage and reuse, and habitat renewal. IERS developed a cost-effective soil-based restoration approach that included the salvage and reuse of topsoil and wood chips to help stabilize and control erosion on steep cut and fill slopes. Prior to grading and road construction, trees were cleared and chipped and topsoil was removed and stockpiled. Specific soil and vegetation treatment elements included application of salvaged topsoil, tilling to mix salvaged topsoil with subsoil, surface and subsurface roughening, hand application of organic fertilizer and grass-dominated native seed mix, and applying wood chips (from onsite tree removal) as surface mulch. This project is the largest known example of topsoil salvage and reuse in the Sierras. Ongoing monitoring is being conducted in an effort to determine trends and long-term success of this treatment.